Still, maps hold us in thrall. Consider, for example, this exquisite piece created around 1715 by Johann Baptist Homann, a German mapmaker working in Nuremberg. It measures 2 ¾ inches in diameter. Inside, the terrestrial globe (on which California is depicted as an island, a common misconception of the time) is hollow. Split into two parts, it reveals an armillary sphere: a type of skeleton celestial globe that represents the movement of heavenly bodies through circles. This armillary sphere has a band around it that’s illustrated with zodiacal symbols. The globe is featured in Sylvia Sumira’s Globes: 400 Years of Exploration, Navigation, and Power. 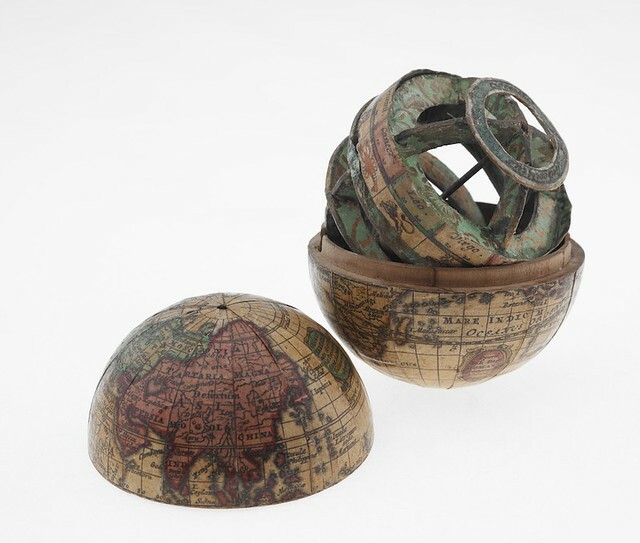 Read more in “An Itsy-Bitsy Early 18th-Century Pocket Globe” at Rebecca Onion’s essential The Vault. 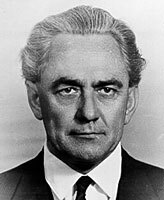 As we plot our courses, we might spare a thought for Samuel Warren Carey; he died on this date in 2002. As a geology graduate student in Australia, he read a translation of Alfred Wegener‘s The Origin of Continents and Oceans, the book largely responsible for introducing the concept of continental drift to the English-speaking world; as a result, he became an early advocate of Wegener’s theory. Carey’s plate tectonics reconstructions led him to develop the Expanding Earth hypothesis– a theory now largely rejected by the scientific community, but one that generated research and debate that helped advance the field of tectonics materially.